On Saturday, July 19 Edgefield held its first Cruise-In on the Square where over 100 classic cars, trucks and motorcycles filled the Main Street, side streets and around Edgefield’s Courthouse Square. 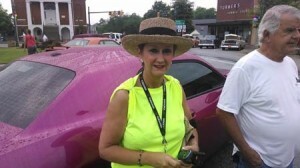 Over 5 car clubs from around the CSRA were represented as well as people coming from as far as Savannah and Bishopville. There were over 30 corvettes lining Main Street in front of the NWTF Shoppe down to the light. Spectators and cruisers enjoyed milling around the area talking car talk and enjoying the restaurants and shops that stayed open to greet them. Beth Padgett, creator of this event, was “over the top” thrilled with the turnout and thanks everyone who brought a vehicle or came in to see the event, and of course, all of the sponsors. Pleased with the high attendance, Mayor Ken Durham, there with his wife Debbie, commented that with this kind of popularity and attendance we need to make it an annual event. WKSX did a live remote from the Square playing Oldies for the audience to enjoy and announced John Spenser of Mount Vintage as the 50/50 drawing winner of $150. Park Row was filled with customers, as was the Pool Hall, and the Civic League sold out of their Spaghetti dinners, even before member Doug Timmerman could get one. The Carolina Moon Distillery had folks lined up for a tasting of their newest products. Traffic flowed smoothly with the help of the walkie talkies the NWTF lent to the Cruise-In staff making it easy to communicate and quickly locate open parking spots for the incoming Cruisers. Small towns across America are struggling to stay alive. Many of the folks who attended the Cruise-In had never been to Edgefield before. After this fun and entertaining experience we’re sure they will come back to visit us again. This event is a great example of someone coming up with an idea and having the courage to approach the town to ask for permission and support for an event that will bring new people to our town to discover all we have to offer with our history, great shops and restaurants, and most of all, our wonderful community.